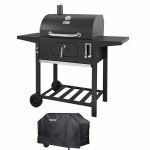 A charcoal grill with a securely attached side smoker box can be very appealing to a backyard chef who wants to occasionally play with classic smoked barbecue. 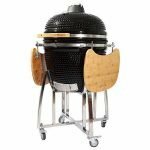 The Royal Gourmet CC1830F-C Charcoal Grill Offset Smoker attempts to offer this kind of capability while also being able to handle pretty much any traditional grilling method. The side smoker box is securely attached and comes with its own damper controls. 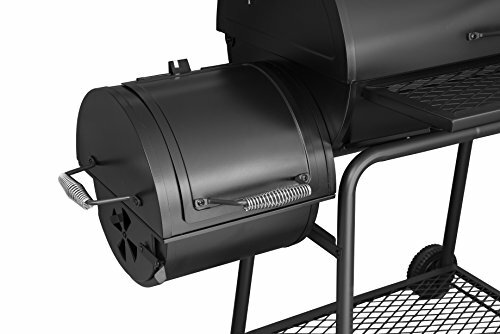 It is designed to allow you to start a small charcoal and wood chip fire in it, without having to have a direct fire in the primary grilling chamber. The heat and smoke then pass through a large vent to slowly smoke the meat. It features a sturdy cart with an expanded metal bottom shelf. This helps everything remain rigid, compared to many competitor grills that sometimes feel a little wobbly. 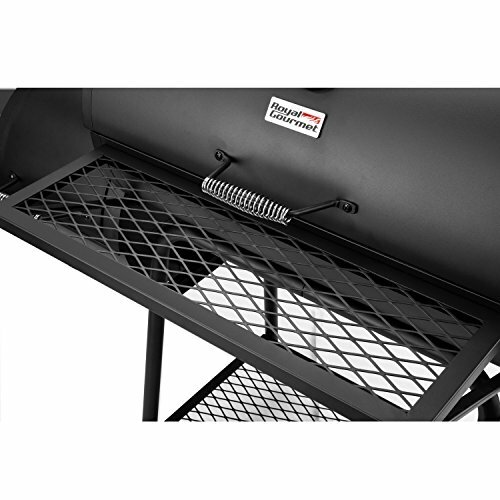 The Royal Gourmet CC1830F-C Charcoal Grill Offset Smoker also has a small expanded metal shelf securely welded into the front to hold serving plates and prep plates. 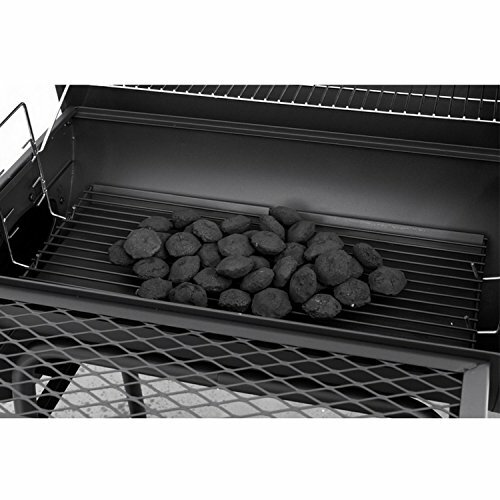 The primary grill grates are specially coated with semi non-stick porcelain. It also includes a modest size warming rack to help hold over food that gets done early. It also includes an adjustable charcoal pan that lets you set the fire up high for a maximum steakhouse sear, or you can set it lower for indirect heating as well as hybrid grilling. 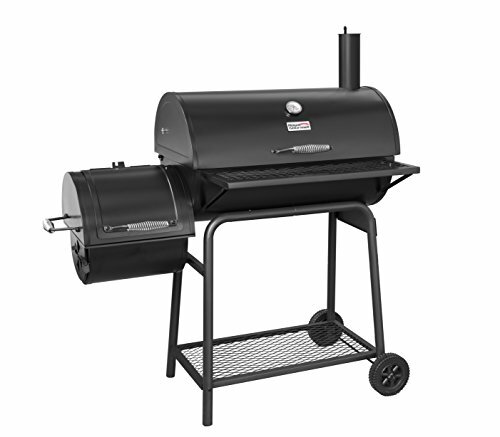 The main grill section of the Royal Gourmet CC1830F-C Charcoal Grill Offset Smoker is made from quality materials, and welds. 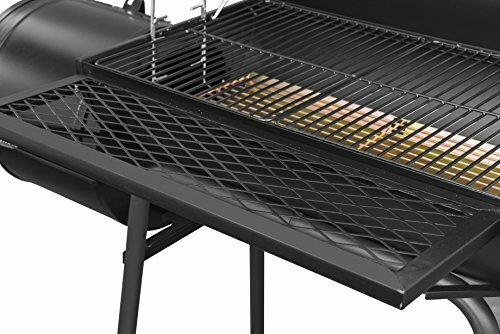 The porcelain coating on the grill grates is nice, but it would be even better if the grates were thick cast iron instead of thick rolled wire. The expanded metal shelf on the bottom of the cart provides a lot of rigidity holding the four legs securely together. There are some quality issues with the side smoker. While it is secured nicely to the main grilling chamber, and the vent is large enough to allow a significant amount of smoke to pass through. However, it is made from thin metal and it is a little on the small side for heating the grill’s main grilling chamber. If you make a large fire in the small smoker box, it can overheat it and exceed the heat rating on the firebox paint. The hinges on top of the smoker box aren’t 100% watertight. If you leave it uncovered and a big rain storm hits, water can drizzle drip down into the smoker box. Residual water on its own can lead to rust issues. If there is a little ash left in the smoker box, it can also lead to corrosion issues. The best way to get past this is to purchase the grill with a cover. The Royal Gourmet CC1830F-C is relatively easy to assemble. With some basic tools and skills, you should be able to put it together in a little over an hour. 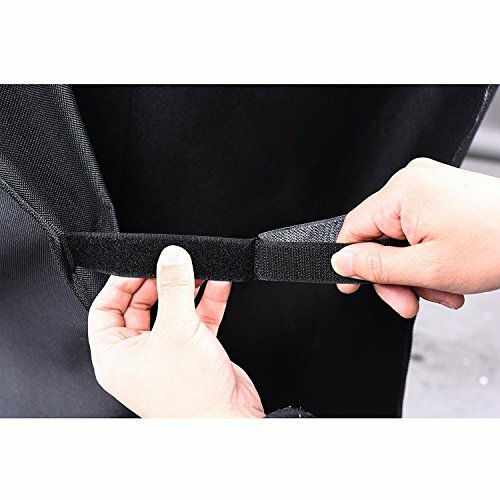 Just make sure to tighten all the fasteners rock solid. The Royal Gourmet CC1830F-C does a pretty good job of being a direct heat charcoal grill. With the charcoal pan adjusted to its highest setting, it can provide a near steakhouse quality sear to burgers, steaks, and chops. When the charcoal pan is adjusted to its lowest setting it can easily handle bone-in, skin-on pieces of chicken. If you set the charcoal to one side it can even handle hybrid grilling tougher cuts like chicken leg quarters and chicken wings. Overall the adjustable charcoal pan is a nice feature. However, it can be pretty difficult to adjust in the middle of a grilling session. If you do want to attempt it, you should get a pair of quality welding gloves. The heat in the metal will pass through simple kitchen hot pads to give you a nasty burn! The offset smoker box is a little bit of a disappointment. It’s a little bit too small for the size of the main chamber. This tempts you to build a big fire in the box, which can warp the thin metal and even exceed the rating on the firebox paint, causing paint peeling and bubbles. If you start a small fire it doesn’t necessarily pass enough heat through to the main chamber to efficiently smoke a larger piece of meat like a brisket or a big pork shoulder in a reasonable amount of time. However, a small, low heat fire creates just the right amount of smoke to perfectly prepare a large piece of fish like a full salmon fillet. 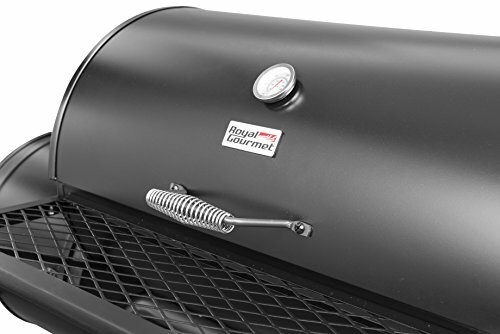 When dialed in just right, it can also smoke a nice rack of pork or beef ribs. If you do want to make a brisket or a pork shoulder, you should use wood chunks, which are less likely to flare up and will last longer than wood chips. You might also want to try building a small charcoal fire in the main grilling chamber, with the coal pan set to its lowest setting, then place the meat on the far side of the main chamber. The main grilling area is 438 square inches, which is large enough to handle grilling a large amount of food. The Royal Gourmet CC1830F-C also has a 179 square inch swing away warming rack, for a grand total of 617 square inches. The side smoker box is nice for adding smoke to certain cuts of meat like fish or ring sausage. Yet, it’s a little small for smoking larger cuts of meat. 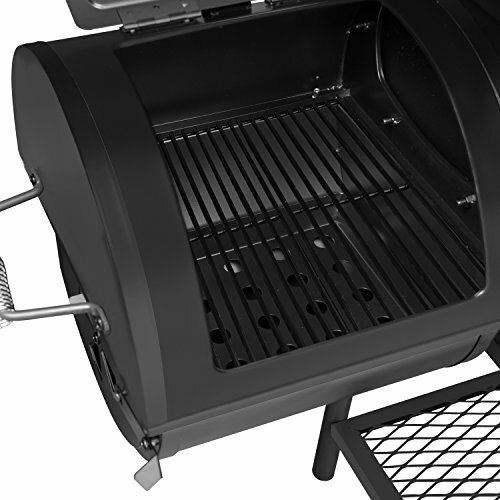 Charcoal grills are always harder to clean than gas or infrared grills. The Royal Gourmet CC1830F-C attempts to make it a little easier with their removable coal pan, which allows you to pull out a significant amount of spent embers. Anything else in the bottom of the main chamber will need to be scooped out by hand. The side smoker box is somewhat more difficult to clean as you have to reach down in and scoop ash out of a cramped little chamber. The grill grates can be easily scraped down. Since they’re porcelain coated, you can pull them out and soak them in warm soapy water, if you need to release any stuck-on material. The Royal Gourmet CC1830F-C comes with a one year warranty from the date of purchase, assuming normal use. The Royal Gourmet CC1830F-C comes does a good job serving as a grill. It has a sturdy base, adjustable charcoal pan, and enough room to grill up enough food to feed a big family. The side smoker box is it’s one weak point. 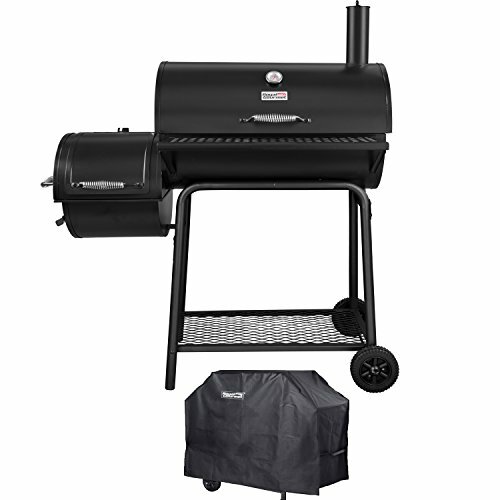 It’s too small to allow you to barbecue large pieces of meat, and without a cover, the leaky hinges could lead to rust issues. Still, for the price, you can get around these issues, with a basic cover, and some thoughtful coal placement. Easy assembly, total 800 sq. in. cooking surface with porcelain steel cooking grates for main chamber and chrome warming rack.